On the first day of kindergarten, your little one seemed so small walking through the school doors. Graduation seemed unfathomable, yet, in the blink of an eye, your child grew up. 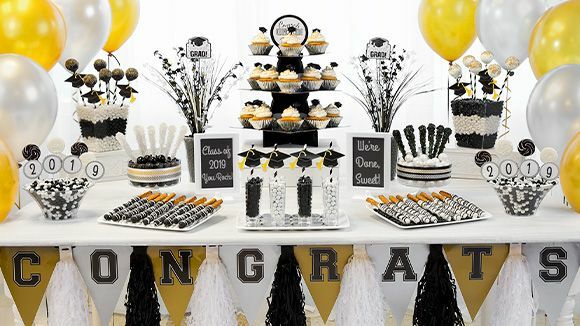 With graduation day on the horizon, how do you make the most of the occasion? Show your joy by hosting a party that captures your pride and love. After all of these years, your child has formed so many connections: friends, teachers, neighbors and family. Don’t hesitate to ask people to attend. You are simply acknowledging that a community cares for your family. You are reminding your loved one that a support system exists and that people are proud. Allow others to share your excitement. As you pick up your party supplies, make some personalized choices. Dig into those photo albums for some candid shots. Blow them up, and hang them in the house. Want to greet your guests with style? Yard signs or personalized banners can set a lively tone. Don’t forget to select a centerpiece that makes an impression. Graduation candy bouquets are handcrafted and fun. You can choose from an array of bouquets, so find one that fits your child’s taste. Guests will love it, and your family can cherish the sweetness for weeks afterward. After all of these years, take the time to remember the past. Set up a memory station. Let the guests reflect on your child’s journey by sharing a special moment. See if a family member will set up a camera where guests can tape stories. If you’d rather stay tech-free, set out an inspirational journal or your child’s favorite book. Guests can highlight their favorite quotations or write out their thoughts. Long after the party is over, this keepsake will serve as a reminder of affection and cheer. Smile as your graduate walks across the stage. It was a long journey. Now, it’s time to kick back and enjoy the finish line.… Read More..